Kohala Zipline is the only course where you control your speed! Zipping out of the shadows and into the light! The lines get so long you can't see the landing platform when you take off! Another REALLY long suspension bridge takes you to the next zip! This is not just a great zipline tour ... it is an aerial trekking course! Race a friend on the final tandem line - almost a quarter of a mile long! Now here's something you don't get to do every day! Twin WhisperLine technology makes the zip lines quieter and faster! Join the staff of Kohala Zipline for the Big Island’s only true aerial trekking canopy zipline experience. 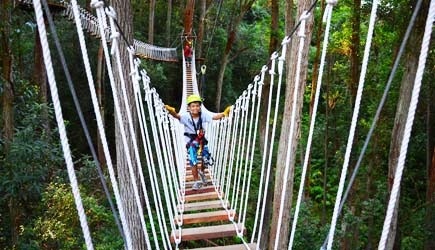 This course features elevated suspension bridges, soaring tree platforms and thrilling ziplines. Once you walk across that first bridge and out to the first tree platform, you are off the ground and high in the trees for the entire tour … except for a snack and restroom break halfway through. And how do you get down to the ground to take this break??? That’s easy … you take your own personal elevator … a 30 foot true vertical free hanging rappel! Sounds difficult? It isn’t. Your highly trained and safety conscious guides will have you zipping and rappelling and navigating the suspension bridges in no time! Guests are clipped into redundant belay points at all times while off the ground. After your brief ground stop it’s on to the second half of the course where more thrilling ziplines and bridges await your exploration. The final zipline is an 1100′ tandem line where you can race one of your companions. This line even crosses over the Kohala Ditch, home to the famous “Fluming the Ditch” experience. See our activity tips section below for our suggestions on doing BOTH the zipline and the ditch tour in one eventful day! Kohala Zipline has several unique and state of the art features that are not found on other zipline tours in Hawaii. They feature WhisperLines – all the steel cables have been coated with nylon to make them super quiet as you zip. They also have a one-of-a-kind smooth-stop braking system which allows guests to control their own speed on each zipline! And if you brake too much and come up a few feet short of the next platform … no worries. Their system lets you pull yourself the last few feet almost effortlessly. Whether you are an experienced zipline enthusiast or a first-time zipline adventure seeker, the Kohala Zipline Canopy Tour will be an unforgettable experience! Tour includes: 9 ziplines. Snack and water. Save yourself the drive to the northern tip of the Big Island, and get so much more for your money! For just $80 more than the price of the Kohala zipline tour alone you also get the transportation to Hawi, lunch at the Pololu Valley Lookout, and a second tour experience … hiking and swimming in private waterfalls! 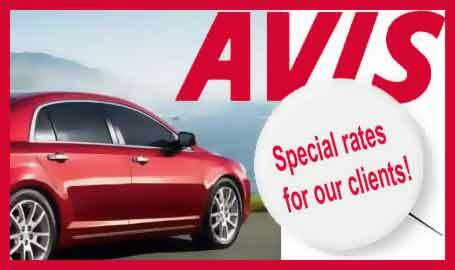 Round-trip transportation from Hawaii Forest & Trail headquarters in Kona or from the Queen’s Marketplace in Waikoloa is included. Tour includes: 9 ziplines, hiking, and swimming. Snack, deli lunch (ham, tuna, turkey, and veggie), cold beverages, and souvenir water bottle. Check In: Kohala Zipline store in downtown Hawi. Zip & Dip departs from Hawaii Forest & Trail Headquarters in Kailua-Kona and Waikoloa Queen’s Marketplace. Direction: As you enter the town of Hawi on Highway 270, turn right onto Hawi Road and they are in the historic yellow building uphill from the gas station on your left. Drive time from Kona is approximately 90 minutes, Waikoloa is 45 minutes, and Hilo is 2 hours and 10 minutes. What to Bring & Wear: Closed-toed shoes that fit securely on your feet (like sneakers or hiking boots), long pants or shorts that are longer (approaching knee length), shirts with sleeves (no tank tops). A sweater or light jacket is also recommended. Where or bring bathing suits for Zip & Dip. Restrictions: Minimum age is 8. Guests MUST weigh a minimum of 70 pounds and not more than 270 pounds. A scale is used at check in and no refunds are given for anyone who misrepresented their weight when making a reservation. No pregnant women, and no one with recent neck / back / bone injuries, or those with an extreme fear of heights may not participate. The zipline course requires a low to medium degree of physical stamina and is suitable for most guests who are in good health. Guests must be able to walk over uneven terrain and handle a short uphill climb. Because of the distance from cruise ship docks in Hilo and Kona, these tours are not practical for our cruise ship clients. We recommend doing the Hilo zipline tour or a Zipline Tour on Kauai instead. 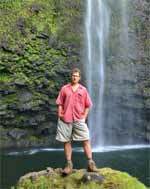 Kauai and Maui vacationers have enjoyed the luxury of multiple zipline tour options for years. Our Big Island clients have been clamoring for this kind of activity for some time. Well, the wait finally ended in 2009 and we were thrilled to offer the Big Island Eco Adventures zipline tour to our clients. Two years later there are now multiple zipline courses on the Big Island. This page features the two that are located on the northern tip of the Big Island in the Kohala area. Kohala Zipline is a sister company to Hawaii Forest and Trail, a very well respected tour operator that we’ve used for years to send our clients on waterfall hikes, Kilauea Volcano tours, and the sunset and star gazing experience on Mauna Kea. That gives this new course instant credibility because Hawaii Forest and Trail and the owner, Rob Pacheco, has a commitment to the highest level of quality in everything they do. I met with Rob for lunch just before doing the tour, and he explained to me all the things that make their course unique. As I walked across the first bridge and onto the platform at the start of line one, it was immediately obvious that this course is indeed unique. Looking out over the platforms that were high in the trees, seeing the LONG suspension bridges running from tree to tree … the scene is reminiscent of the magical Ewok forest of Star Wars fame! This is a cool forest setting unlike any other! The first zipline was a short trainer line, and on this line you learn how to control your speed … this is the only course on the Big Island where you have the ability to do that. All the other courses you stop by hitting a brake that is deployed by the guide on the receiving end of the line. They do that here too, just in case a guest still comes in too fast. But slowing yourself down is easy … and it makes for a very smooth landing and gives you more hands-on involvement during the tour. These lines do run a lot quieter because of the nylon coating on the cable, which makes the forest feel more pristine. When you land at a platform you are still high up in the trees, so before disconnecting you from the zipline, the guide attaches you to a belay point on cables around the tree. After a few more ziplines that got longer and longer, we encountered the first set of suspension bridges. They are long, high, and the steps are p r e t t y f a r a p a r t (see the slideshow above) … making for a heart thumping crossing for most folks. While on these bridges you are clipped to a belay line that removes the DANGER of falling … but not your FEAR of falling … haha. These high and long suspension bridges will play with your head at first, but as you learn to trust the equipment you’ll reach a point where trekking high in the trees is a truly memorable experience! I felt like a flying squirrel at times! Halfway through the tour you will take a break from the trees, and the only way down is to do a 30 foot vertical rappel! Sounds intimidating … you’ve never done that before right??? Neither had I! The guide explained it clearly, demonstrated it for us, and with one guide at the top and one at the bottom it was easy … and it was a blast … and was my favorite part of the tour! You get to do one more of these rappels at the end of the course too! After our brief break from the trees, the next zipline starts high up on a ridge and zips back out to a platform to return you to the trees for the second half of the tour and your feet won’t touch the ground again until the conclusion of your adventure. Some of these lines are long enough and the trees tight enough that you can’t see the landing platform from your “take off point” which adds another level of excitement to the experience! The final tandem racing line is almost a quarter of a mile long. All in all, this tour takes ziplining to another level … literally … with the whole experience lifted off the ground. The Kohala Zipline course is pretty and offers a great feel for the north shore forests; while this course has a seasonal stream it doesn’t offer waterfalls. There is one very awesome waterfall zipline course in the Hilo area that we also highly recommend if you are up for a drive that will take an extra hour or so each way. If so, you should also see the Umauma Zipline Experience. While they are a further drive from the Kona and Waikoloa resorts, they do offer a thrilling zipline tour with amazing views of more waterfalls than I could count (while zipping past them at high speed)! If you decide to do this zipline, we highly recommend you combine it with the Kohala Ditch Adventure … this will allow you to do a water activity and a zipline in the same day (and save yourself a second drive out to the Kohala area). The zipline is just minutes away from the Kohala Ditch checkin … we suggest that you do the Ditch tour in the morning which is typically the sunniest time of the day, change clothes, grab lunch in between tours, and then do your zipline (either course … whichever one your select) at the 1pm time slot. The Ditch adventure adds another $129 per adult and $65 per child … and to make it easy to reserve both you just have to select “AM Ditch PM Zipline” using the form at right and we’ll reserve both tours for the same day for you. The zipline is available 7 days a week, but the Ditch tour is closed on Sundays. By the way, zipline tours do not require any special levels of upper body strength … guests wear a harness and are clipped into the zip line pulley using redundant lines. When you see photos of zippers holding onto a bar or a strap, it’s just for steering purposes to keep facing forward. You don’t actually have to hold on to hold yourself up! 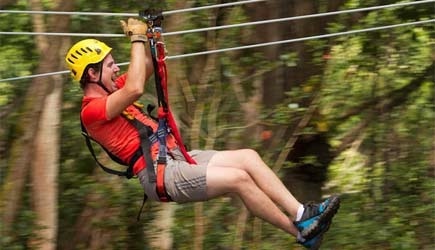 These courses are professionally installed to the highest level of zipline industry standards. Weight restrictions have nothing to do with the ability of the line to hold someone’s weight … the lines are engineered to hold the weight of a pregnant elephant! If a person is too light, they may not make it all the way to the other side. This isn’t really a safety issue as the guides can easily deploy a line and pull the partially unzipped zipper to the other side … or in the case of Kohala Zipline you can easily get the rest of the way by pulling yourself over. But this process adds time and delays the tour. A person who is over the weight limit would come in just a little too fast on many lines, and create braking issues that could be jarring. So, weight limits are there for everyone’s safety and enjoyment of the tour. One word of caution: after you do one of these tours you will never ever want to go anywhere on vacation again if they don’t have a zipline for you to enjoy! Yes, it’s that much fun! Akaka Falls Zipline is another fun experience worth trying!